A theme is a collection of properties that defines the appearance of a report. A theme includes colors, fonts, images, and constant expressions that you can apply to report elements once you add a theme to a report. You can add one or many themes to a report. If a report has multiple themes, you can use the report's CollateBy Enumeration to control the page order in a report. See Set Up Collation for more information. The Theme Editor and the Report - Themes dialog allow you to manage themes in a report. In the Theme Editor, you can create a new theme by setting colors, fonts, images, and Use Constant Expressions in a Theme and then saving a new theme as an .rdlx-theme file on your local machine. Then you can add this theme to your report in the Report – Themes dialog. Also, in the File menu, select Open to open and modify an existing theme and select Save or Save As to save the changes on your local machine. From the Start menu, go to All Programs > GrapeCity > ActiveReports and select ActiveReports Theme Editor. The Report – Themes dialog displays the report's themes. This dialog allows you to create a new theme, add, modify or remove an existing one, as well as rearrange the order of themes if a report has many themes. 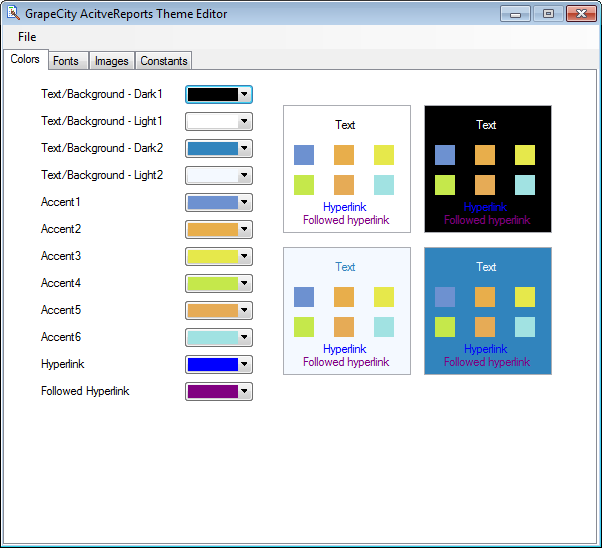 When you select to create or modify a theme, the Theme Editor is opened. In the Designer, click the gray area around the report page to select a report. In the Properties window, select the Themes property and click the ellipsis (…) button to open the Report - Themes dialog. With the report selected, in the Properties window under properties where the commands are displayed, click the Property dialog link. In the Report dialog that appears, go to Themes. See Properties Window for further information on commands. On the Report menu, select Report Properties and go to Themes in the Report dialog that appears.